Elena Senyavskaya. Biography. | Interportal "Fascism-XXI at your door"
Home » Elena Senyavskaya » Elena Senyavskaya. Biography. Elena Spartakovna Senyavskaya was born in 1967 in Moscow. In 1989 she graduated from the History Department of the Lomonosov Moscow State University (MGU). 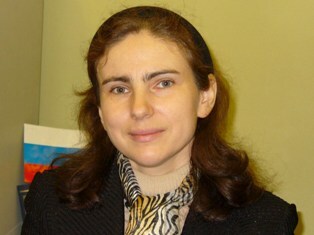 In 1992 after completing her postgraduate studies, she worked at the Institute of Russian History in the Russian Academy of Sciences, where she has been a leading research fellow since 2000. She completed her Doctorate of Historical Sciences in 1999, completing a thesis on "The Psychology of Russian war participants in the 20th century - Comparative historical research. " Since 2004 she has been a Professor in the Department of Russian Contemporary History at the Russian State University of Humanities (RGGU). Her specialisms include Russian military history of the 20th century, social history, history of everyday life, historical psychology, military psychology and military sociology. She is also the founder and head of the research course "Military-Historical Anthropology and Psychology." Honours include the Laureate of the State Prize of the Russian Federation for young scientists, for outstanding achievements in the field of science and technology (1998) and the Medal of the Russian Academy of Sciences (2001). Member of the Academy of Military Sciences (2001). Member of the Writers' Union of Russia (2002). "The history of wars of Russia in the 20th century in the human dimension: the problems of military and historical anthropology, and psychology. A course of lectures." M., 2012. "Military-Historical Anthropology and Psychology (based on the Russian wars of the XXth century)." M., 2012.